Tomorrowland falls short of greatness it was capable of achieving, says Paloma Sharma. Coming The Incredibles and Ratatouille director Brad Bird, Disney's Tomorrowland is an over two-hour science fiction/adventure film that ends up being more of an exercise in brand building than storytelling. Bird's new directorial after Mission Impossible - Ghost Protocol and co-written with Lost co-creator Damon Lindelof, Tomorrowland is all about innovation, optimism and imagination. Well, at least on the surface. Scratch away the bright, happy colours and star power lent by George Clooney and Hugh Laurie, and you're left with the basic Disney template being recycled film after film. Not that anyone is complaining. The Disney formula has created happy childhood memories for more than one generation of kids but when it comes to Tomorrowland, a film that so indignantly insists on originality and out-of-the-box thinking, one would expect it to practice what it preaches. The film opens with a sombre looking Frances 'Frank' Walker (George Clooney) breaking the fourth wall as he informs the audience that the end of the world is coming in the near future. However, a female voice in the background keeps interrupting him. The owner of said voice, Cassey (Britt Robertson), then persuades Frank to tell the story of a different future -- the future that was before him when he was a child. Frank takes us back to New York, to the World's Fair of 1964 where he, at about age eight or nine, brings a jet pack he invented on his own and shows it to a slightly shady Nix (Hugh Laurie). Since the jet pack doesn't exactly work, he gets rejected by Nix but Athena (Raffey Cassidy), a girl in Nix's care, spots potential in the young inventor. Athena gives Frank a pin with the letter 'T' on it, asking him to follow her and Nix without being spotted. Frank complies, only to find himself in a futuristic world separate from our own, called Tomorrowland. Tomorrowland, one is told, is a place where artists and scientists can create things beyond their wildest dreams without the fear of politics and bureaucracy. Frank stays back here, only to end up creating something so dark that it threatens the future of humanity -- for which he was exiled from Tomorrowland, and he could never return. However, his invention is still a threat. To finish what Frank started, Athena seeks out another young genius, Cassey Newton. Frank and Cassey must try to put aside their differences, find a way to get back into Tomorrowland and find a way to destroy Frank's invention before it destroys the world. Most stories come with a beginning, middle and end. Tomorrowland comes with a beginning -- and boy, what a beginning! -- and then something resembling a middle but it never seems to end. Once the premise has been set, the film begins to lose track of what story it wants to tell and ends up including scenes either full of mundane conversation or exciting action that, sadly, does not entirely align with the film's endgame. While worse writing has gone into more hyped films, this is just not something one expects from Lindelof and Bird. It makes one wonder whether the two just had too much material to work with in too little time. Tomorrowland's ideals may seem lofty to more hardened hearts, but nothing bad ever came from promoting a 'can do' attitude. The trouble begins when the promotion turns into preaching. Leading by example could have been the way to go for the film. It could have broken away from the Disney prototype and done something entirely different and equally wonderful. It's a shame that it doesn't. It's like a more cheery, simplified version of Interstellar, Tomorrowland obviously has more mass appeal and a wider audience. 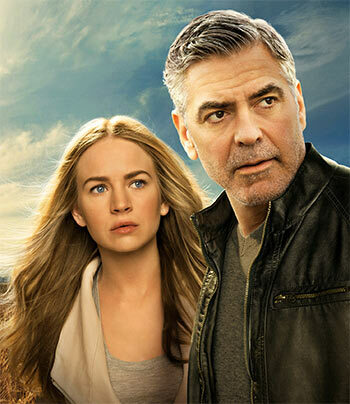 For a film whose name would look better on the poster of a music festival, Tomorrowland doesn't manage to come up with music that blows one away. In fact, nothing about the film really does any wonders. The visuals are pleasant. The acting is good. The story is good enough. But not one factor in the film pushes itself beyond this line, towards greatness. For a film with such immense potential, Tomorrowland plays it too safe.